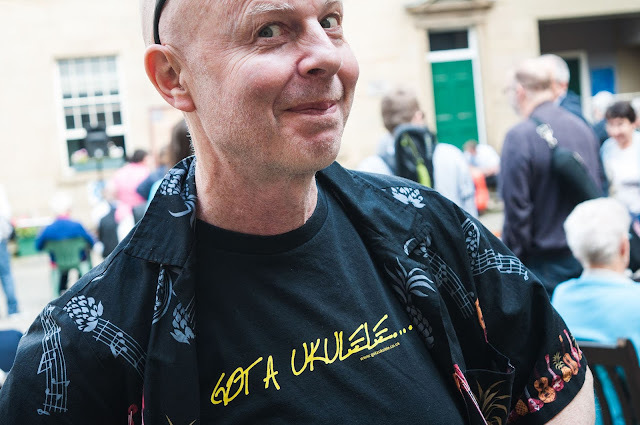 I was delighted to see this picture appear on Facebook the other day for a whole heap of reasons, and not just because there is a Got A Ukulele T Shirt in the picture! First of all - that fine fellow in the photograph is Paul Redfern - ukulele player and performer in one of my favourite outifts that I have featured on this site many times - The pUKEs! Second of all, the photograph was part of a series of wonderful shots taken by another ukulele player, the supremely talented Liam Capper-Starr - performer in his own right and organiser of the much lauded Uke-East Festival. Incidentally - Liam has a new full album out now which you can find on that first link! The third reason is a sadder one - it was taken at GNUF and I wasn't able to go. Still - nice when things from friends come together like this! Had you not met him at one of the N'Ukefests Jim?